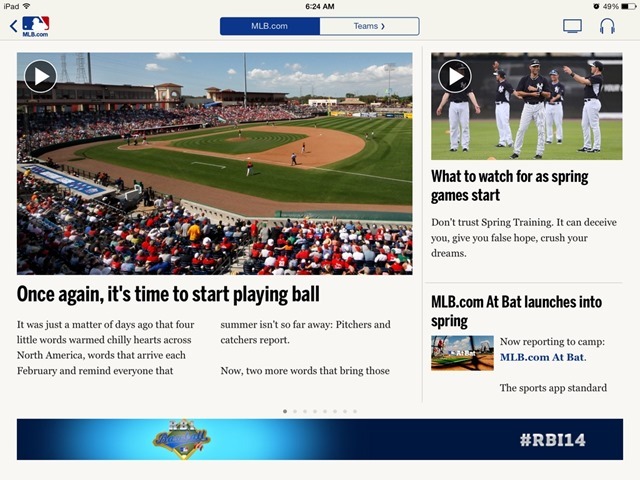 The MLB.com At Bat iPad app has been updated this week, to Version 7.0.0. This is an update for the 2014 season as Spring Training activities start and the new season is only a little over a month away. This was the first major US sports app that made a big impression in iOS and it remains one of the best official sports apps for the iPad. Here’s an App Store link for MLB.com At Bat; it’s a free app with numerous In-App purchase options ranging from $2.99 to 129.99 to gain access to more live content and similar features.